Ooh, weekly updates! I like. Didn’t Cecil’s coat get empowered by him entering the Chaotic dimension? Could explain why it doesn’t like Toby now that he’s only aligned with Order. Not quite. Malphast’s Mom altered it as part of a plan to get them access to the Prime Material Plane. Specifically, it was a payment to get Cecil to help carry the gate pendant. To be precise it was also made not to harm him… And it detects a threat that could kill him and his master. Seriously the unstable being with a chance of blowing up a planet by accident doesn’t translate well to semi sentient creatures in terms of not attacking them in order to stop the doomsday moment. Joey’s probably right in the Cecil’s coat and Zodon’s new mech- creatures of chaos- wanting to attack Toby for now being a creature empowered purely by Order. Is it because they sense that Toby is a threat because his powers come from Order? Or is it because the removal of the Chaotic portion of Toby’s powers has somehow made him more dangerous than when he had both, even if they produced unwanted side-effects to balance each other out? 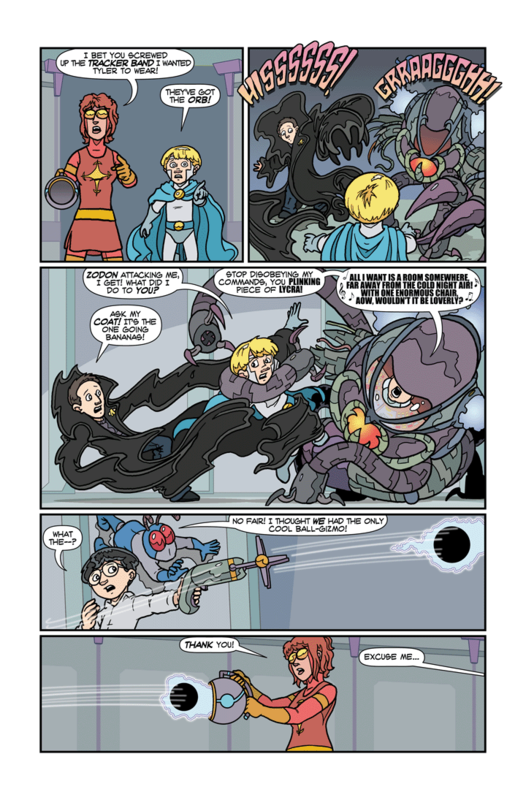 Quibble: Not empowered by Order, but creating it (as evidenced by the Chaos Orb being the forced-form of the backlash). Remember, his native power is, essentially, reality-warping omnipotence. But the Order/Chaos forces imposed a curse on him that forces him to balance out anything he does, so that if he causes Order, his power causes Chaos as well. And vice-versa, which is the thing I think Toby and everyone around him forgets. What he needs to do is learn what causes each, and make sure to create effects such that he gets something he wants out of both actions. Still limiting, but far, far less hazardous. Heck, that might be why flying causes no backlash: it either is Order/Chaos-neutral, or it’s mildly Chaotic and he creates so much Order that the flight counts as repaying some of that debt, marginally lessening the Chaos-backlashes he’s seeing. …y’know, I suspect that Tyler getting powers causes so much CHAOS in the world that the inversion of who had powers and who didn’t was an ORDER-backlash. It takes that many people with powers, who appreciate what it’s like to not have them, to bring the order that Tyler is destined to. And Zodon’s vessel was created by orbpower… so it’s basically a high-Chaos device. And the last panel is someone getting caught with their hand in the cookie jar! I’m thinking that’s just Moonshadow. Wow. The situation has turned into utter chaos! I believe Tyler is about to have a “Revenant” moment! Maybe, though it might be the Eldritch Mage guy from earlier. Or it could be Lester, as theorized by other people. So many characters… Which one is Lester? Introduced in the support group scene at the start of this story. Former supervillain being forced to go straight after the loss of his powers, and now chaperone for this “sleepless sleepover”. Zodon is singing Julie Andrews. Now I’ve seen everything. I was expecting something from Little Shop of Horrors. I’m pretty sure that that is Audrey Hepburn, not Julie Andrews, in My Fair Lady. Well, I get to be embarrassed now since Julie Andrews starred in the play while Audrey Hepburn starred in the film. I believe it’s still Julie Andrew’s voice in the songs. I’m thinking it’s about time for a real threat to appear, why the coat and mech suit are going nuts. The sphere in Ron’s hand wasn’t seen as a threat. The skeevy woman, I cannot trust for any truth. I think all the kids more or less mean well, but people WANT the power. One more possible player: Lester. A teleporter might return for revenge; a dragon or something might be a good twist; a ship or space station might try to disengage their pilot / parent; the mighty “meh” may be the solution here either by the kid or moon shadow with a drawing (actually that might help cure the chaos/order balancing); Tyler’s parents might be more immediately likely though. I wonder whether anybody there will pick up on that confession about “the tracker band I wanted Tyler to wear”…. Tho considering she told several other metahumans about the trackerband she gave Tyler, I assume they approve. Maybe she just suggested it? Well, they had to give him a specific one because of all the ‘Tyler’s’ running around setting off the security system. Now, the question is, are those shadows just Zodon’s work, or are there more distractions in play? I suspect that she’d arranged for Tyler to appear to be in one place that he wasn’t cleared for… rather than, was is the case thanks to Zodon, in so many places at once that the tracking system is onviously messed-up. I actually feel better about Tyler’s school tracking him than his “parents”. I don’t think he has that with him in his Moonshadow outfit though. Would be potentially useful if he did though. If they could extract chaos from him then why not also extract order? Because what’s giving him superpowers then? His natural genetic talent. He had his powers before the Imp and Cherub messed with him, remember. He didn’t have most of the brain and his own will before the Imp and Cherub messed with him. Interesting. I wonder if the plan for Tyler involved investing him with the Chaos Orb, restoring ‘balance’ by making him the “Evil Twin” clone? It seems redundant, since chaos seems to be something that gathers around Tyler regardless. The sphere was created by siphoning chaos off of Quantum Powers so that his powers didn’t have as many bad side affects. Looking at it that way, QP has too much order. Zodon’s mech is created from the sphere (chaos) and Cecil’s coat was created by a being of chaos, so they are now antithetical to QP. So this is another chaos versus order fight. However, is the chaos in this way attacking QP or is it trying to recombine with him in order to re-balance his powers? Also, did the ball catcher pull the chaos sphere, or did Ron’s power force him to release it that direction. Because his power has operated on its own before.